Kojo Senoo/Contributing Photographer Pictured: Thomas Hays, a senior majoring in biomedical engineering, who is researching the use of 3-D printing to create human organs. The creation of human organs through 3-D printing may soon become a reality, thanks to researchers like Thomas Hays, a senior majoring in biomedical engineering. Hays, who will attend Stony Brook University School of Medicine in the fall, got involved with laboratory research as a sophomore and pursued a 3-D printing project with Kyle Reeser, a second-year graduate student studying biomedical engineering, and Sebastian Freeman, a fourth-year Ph.D. student studying biomedical engineering. The goal of the project is to create an artificial pancreas through 3-D printing. The process requires a bioengineer to take autologous cells — cells from one’s own body — and layer them repeatedly, creating 3-D tissue to be reinserted into a patient’s body. Autologous cells are used because, almost always, our bodies reject foreign tissues and organs, whereas they readily accept our own developed cells. Tissues with less vasculature, or fewer blood vessels in them, such as skin and cartilage, can already be processed in the 3-D printing world. Hays estimated that it will be about a decade, if not longer, until we begin to see some of the more vascular structures enter the medical world through 3-D printing. 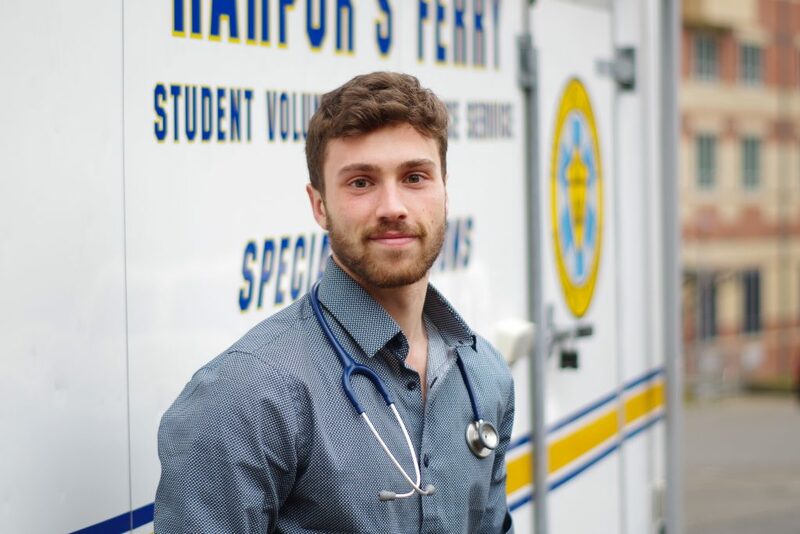 Hays explained that he developed his clinical skills through his involvement with Harpur’s Ferry ambulance, and the hands-on engagement taught him how to work on a team. He and partner Rushi Shah, a senior majoring in biomedical engineering, built an automated respiratory device. Hays explained that this was the moment he realized that he wanted to mix the research component of biomedical engineering with the clinical applications of it. The device made use of a standard emergency medical services mask, and inserted into it a thermistor, or electrical resistor whose resistance is reduced by heating. This device is practical in determining if an individual is hypo- or hyperventilating, a key vital to take note of when in an emergency situation. Although the automated respiratory device cannot be used by Harpur’s Ferry due to U.S. Food and Drug Administration laws, Hays said it was interesting enough to simply watch the process unravel from an innovative idea to a real product.